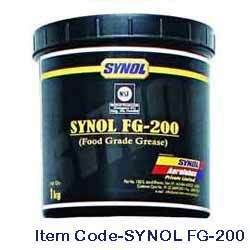 Synol FG-200 is a non-toxic, tasteless, odorless, soft grease for food & pharmaceutical industry. It is an excellent lubricant for moderate loads, temperature & speeds. In case of accidental contact with processing material, the grease poses no health hazard. It is highly stable with good resistance to water washout, oxidation & very low evaporation rate. It is approved by for category. Looking for Food Grade Grease ?